Government agencies can be a useful tool to carry out the will of the people. They can manage water, sewers, roads, borders, and provide many other public services. Some type of bureaucracy is essential when an agency is charged with a mission that serves thousands or millions of people. Government agencies are created for the public good. But, too often bureaucracies are a symptom of personal irresponsibility and the desire to let someone else solve our problems. They can grow uncontrollably and spend tax dollars foolishly. Once they have served their purpose, they are hard to terminate. They are hard to hold accountable. Bureaucracy occurs in large corporations, large churches, and in governments. But a bureaucracy is particularly pernicious in government because it can use its legal power to tax, oppress, and take freedoms away from those they are intended to serve. If bureaucracy grows out of control in a business, the business may go out of business. If it tries to control a church in a country where there is freedom of religion, people will just leave that church. Not so with a government bureaucracy. Citizens often feel powerless to combat government bureaucracy. Look at the Met Council. This is an entire government funded by your taxes but not run by any officials you elect. It is a bureaucracy that makes centralized plans for a regional infrastructure, and can make rules that restrict what you do with your property. It is a government imposed on citizens from the top down and has little relationship to freedom or democracy. We have hit a tipping point where, instead of making our lives more convenient, the weight of government bureaucracy is straining the entire economy. The growth of bureaucratic government into a Leviathan has been very frustrating to citizens around the United States as rules created by agencies they have no control over cause people to lose their jobs and property. The Tea Party movement is a reflection of this frustration. 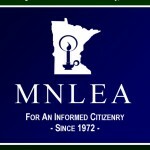 Bureaucratic government growth has nothing to do with the limited constitutional government envisioned by the Founding Fathers and championed by Minnesota LEA. But, it is rampant in Minnesota. In the last two LEA reports, our introductions were titled, “A Victory of the Government over the People,” and “Triumph of the Nomenklatura.” We found the steady uncontrolled expansion of government bureaucracy, and the attempts by bureaucrats to increase their power and insulate their positions from the electoral process, seriously troubling. Citizens often vote for candidates who promise to give them some good that is ostensibly free. Inevitably such a promise turns into a new bureaucracy, inefficient delivery, and increased taxes on citizens. Some people are genuinely deceived by false political promises, but many people simply don’t care that other citizens are robbed to pay for something they want. Selfishness frequently trumps citizenship. Such a mentality is the main reason Minnesota is facing a budget deficit. In the process of creating bills for the benefit of interest groups, fraud and deceit are used by both the left and the right. But, many times legislators are deceiving themselves with little ponzi schemes they wish would be true for ideological or financial reasons, even if they defy natural and economic law. One problem is when governments set up some type of business or quasi-business to raise money for agencies. Such businesses would be more efficient in the economic sector where competition weeds out inefficiency, but an agency-run business gives the agency an independent economic power base that is potentially dangerous to citizens, and hard to kill. In recent years there has been legalized gambling and state lotteries. There was a huge potential market for gambling that had earlier been outlawed for moral reasons. First came gambling on Indian reservations governed by independent tribal laws. Then, when local and state governments realized there was a potential market to exploit, we soon had the Minnesota Lottery and support for other gambling. The Minnesota Lottery is a government-run monopoly. In 2005 the lottery generated $106 million of which $70 million was net receipts and $36 million were business expenses. Another 11 million went to state agencies and $28 million went to the Environment and Natural Resources Trust Fund. The trust fund now after 20 years has a principal of nearly $500 million, the interest on which is used to help finance environmental projects. There is a pile of money growing to support a little bureaucratic kingdom that, when all is said and done, gives out to environmental projects an amount about equal to about what the agencies themselves consume. This agency and its nest egg are pretty well protected from the will of the voters and the annual budgets of the legislature. Much of the $100 million of the current DNR budget still comes from general funds controlled by legislators, and ultimately the citizens. To a bureaucrat such funds are precarious and bureaucratic jobs and fiefdoms can be eliminated with the stroke of a pen. Like other people, a bureaucrat wants to guarantee his job security and seeks to support his agency with independent revenue generation like park fees, fishing licenses, and the lottery trust fund. But there is never enough economic security for a bureaucracy. New money for the environment was sought, and in 2008 we passed an unconstitutional referendum for .375% sales tax for the arts and the environment. It was unconstitutional because it did an end run around the governor, a constitutional check on the legislature. The purpose of a constitution is to set forth the machinery of government, not to pass laws to support government agencies, as this referendum did. Last year that dedicated sales tax raised $300 million, over half of what it took 20 years to raise through the lottery. Those who pushed the referendum did not want the new money to comingle with the existing appropriations for the environment. So, it became an opportunity for new groups of people who want independent and guaranteed funding for their own projects and agencies. Many new councils and bureaucratic jobs were created with these funds, but each one of these new agencies further burdens the citizens who are already overburdened with taxes. We should be concerned about the end result of large agencies with their own independent economic base. With the power to write regulations that become law, such agencies, as economic monopolies, have near absolute power. They will compete with the economic sector, appropriate land and resources, and continue to grow with the unfair advantages because they can use the power of the law. The new sales-tax-based clean water agencies will inevitably clash with old clean water agencies unless they are somehow coordinated centrally—but they will resist such central direction. Now a new Vikings stadium is being sought, and the governor threw out the idea for a Vikings lottery. Of course, an economist knows that only a certain number of people gamble, and the lottery market is now pretty well saturated. So, if we sell Vikings stadium lottery tickets, people will buy fewer lottery tickets for the environment. The DNR is likely to be the main opponent of lottery tickets for a stadium. While, the Minnesota lottery was created in the name of doing good, and Minnesotans might be proud of having a growing trust fund for the environment, we should be concerned that it gets its money from economic redistribution rather than a tax based on a growing economy. We also need to be concerned when government agencies use money to advertise get-rich-quick promises. Lottery advertising tempts people to buy a lottery ticket instead of buying bread for their children, or looking for a job. This is immoral. It is legal but immoral. Governments can only survive on the foundation of responsible citizens, and tempting people with false hopes encourages irresponsible behavior and hastens a government’s downfall. I have used the lottery and environmental agencies as examples, but the nature of other government bureaucracies is similar. To understand a bureaucracy, you need to understand human nature, and our founding fathers understood it well. People in government bureaucracies have the same human nature as other people. They want to improve their well-being and often seek to maximize their financial income. Rational maximization of wealth works fine when an individual is in a competitive business, because improving his product or service, or lowering his price, will bring him greater economic well-being. In a competitive market the only legitimate way to increase your own economic well-being is by making life better for someone else. But such economic laws do not work in the legal sphere. Governments do not create goods; they only redistribute wealth. In a legitimate democracy, such redistribution needs to originate with the people. Good government is supposed to be a servant of the people, not a number of independent agency fiefdoms. A legislator, if he is a representative of his constituency, should only vote for bills his entire constituency wants. He is elected to represent an agency. And, if a bill would benefit only one district in the state, then all other legislators should vote it down. However, in the legislature today this hardly ever takes place. One evil, that we constantly lament, is the omnibus bill that combines more than one item into a bill. In this way legislators combine all sorts of special interest legislation their constituents do not want into garbage bills. An agency doesn’t produce wealth, so in order for bureaucrats to increase their own income or benefits, they must receive a larger appropriation from the government, or ration or cut services. Bureaucracies are easier to defraud than individuals. Medicare is an example with 20% of its budget going to fraudulent claims. Many drug dealers have switched to Medicare fraud because they find it safer and more lucrative than selling illegal drugs. Bureaucracies are more likely to defraud taxpayers than individuals providing a similar service. In my book Life, Liberty, and the Pursuit of Happiness, Version 4.0, I explained how our Constitution was designed to protect against the expansion of government power, and how its protections have been ignored, circumvented, and legally reversed. The most oppressive special interests are the government agencies and bureaucracies that are so difficult to battle and hold accountable. Regardless of the good reasons for establishing a government agency, or the intentions of its original members, ultimately an agency turns into an institution whose employees seek financial security. It is honorable to sacrifice yourself as a civil servant to the benefit of society, but dishonorable to sacrifice society for the benefit of yourself. Unfortunately, it is very hard to keep an agency honorable. I have often thought it might be wiser to primarily staff government agencies with high school graduates as a form of service to society, paying them minimum wage, and then rewarding them with college tuition after their service, rather than to hire professional bureaucrats. In this way we would not have such serious problems of entrenched self-interest. Such a plan would both reduce the cost of government overhead and provide young people with a sense of public responsibility and an education for a future life in the private sector. Now I need to introduce our next speaker, a friend of our Vice-President John Augustine, and man who has dedicated himself to battling the illegal and unwanted products of government agencies. Erick Kaardal grew up in Redwood Falls, received his Law Degree from Harvard, and is now a partner in the Minneapolis law firm Mohrman & Kaardal. He is the founder and General Counsel of neopopulism.org, an organization dedicated to identify rules, regulations, laws and policies that institutionalize elitism at the expense of the average citizen. He has been working to throw out unconstitutional laws and fight elitists that enforce their will at the expense of the people. I hope that he can share some thoughts that will help our legislators get some inspiration for the battles they have to fight daily in a hostile environment. Also, I hope he will help the members of LEA to understand the types of legal measures and cultural reawakening needed to help citizens to reclaim the government created to serve us. After we hear from Mr. Kaardal, we will have comments and questions from our legislators and members that might help the LEA better do its job in evaluating bills. We met at the Brigade Reunion. The books that describe how Landslide Lyndon stole the primary election with fraudulent ballots is described in “Lone Star Rising” by Robert Dallek pg 326… and “Means of Assent” by Robert A. Caro Chpt 13.